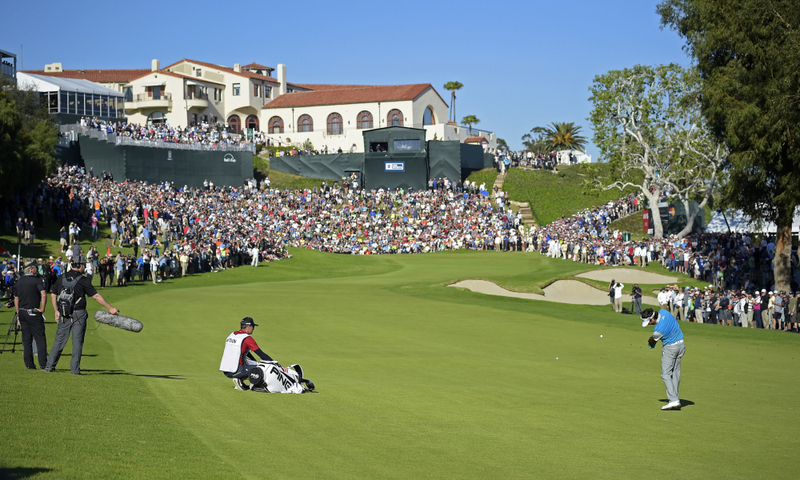 This is one of those weeks where, despite the presence of some of the sport’s biggest names, the course is always the star of the show– Riviera has stood the test of time and is one of those rare gems that draws near-universal praise from the players. A par-71 that measures just over 7,300 yards, it’s not terribly long, but big hitters have had lots of success in this tournament in recent years, most notably Bubba Watson, who has won this event three times in the past five stagings, including last year. Dustin Johnson and Phil Mickelson have also won here in the past decade, but some of the shorter guys have got in on the act as well, with names like James Hahn, Aaron Baddeley, and Steve Stricker all gracing the trophy since 2010. If you’re not going to be long at Riviera, you’d better be straight, as the kikuyu rough that lines the course is penal and difficult to avoid. The greens are small, firm, and knobby, making them a real challenge to find, even with short-to-mid irons. As a matter of fact, the greens at Riviera were the hardest to hit in regulation on the PGA Tour last season, with players finding the putting surface a mere 53% of the time. The greens themselves are a bent/poa mix, and they’re usually pretty slick, though three-putt avoidance isn’t generally an issue on account of their size. Scrambling ability and proficiency with the irons are two absolute musts this week. Xander Schauffele (24.0)- Schauffele has rocketed to stardom over the past year-and-a-half, notching four PGA Tour victories since July of 2017. A southern California native, he seems especially comfortable out West, as he proved again last month by kicking off 2019 in style with a victory in Hawaii. Since then, he’s finished T25 at the Farmers Insurance Open and T10 in Phoenix, giving his eight top-25s and two wins in his last nine worldwide starts. It can be reasonably argued that Schauffele has been the best player in the world since September of last year, and he’s definitely been the best putter, gaining an average of 4 strokes per round (!!) on the field with the flat stick in 2019. Riviera seems like an ideal fit for Schauffele, and he certainly looked comfortable on debut last year, finishing 9th in this event after closing with back-to-back 68s. Recent form, course history, strike rate… there’s a lot to like about the X-man this week, and at better than 20/1, the value is there. He’s my favorite bet on the board. Cameron Smith (64.0)- After a slump that extended across most of last summer, no one quite knew whether the young Smith was going to bounce back to become a force on the PGA Tour, or whether the grind of the world’s most competitive tour was proving to be too much for the 24-years old Aussie to handle. As we sit here in February of 2019, he seems to have answered the question conclusively: Smith has now found the top-25 in 8 of his past 10 PGA Tour starts, a stretch which includes a pair of third-place showings in last year’s FedExCup Playoffs, and in December he out-dueled countryman Marc Leishman to win the Australian PGA for the second time. His most recent starts have produced a T9 at the Farmers Insurance Open and a T15 in Phoenix, so I think it’s reasonable to say that Smith is currently playing the best golf of his career, and Riviera sure seems like a course that fits his game. But don’t take my word for it– Smith himself said last year that Riviera “looks very similar to home… the same sort of mix and style of holes. I’ve grown up on kikuyu, so love the grass”. His results here have steadily improved– T63 in 2016, T28 in 2017, and T6 last year– and as mentioned, he’s never played any better than he has over the past few months. I’m fairly enthusiastic about Smith here at better than 60/1. Jason Kokrak (118.0)- Though he’s not a name that comes immediately to mind when thinking about potential contenders this week, Kokrak may have a better chance than his price would suggest. He’s always been one of the longest guys on Tour, but lately he’s also found a groove with the irons, ranking in the top-30 among all qualified players (at least 15 rounds) in both driving distance and strokes gained on approach since last month’s Desert Classic. He’s rode that solid ball-striking to three consecutive top-20 finishes, so he has some momentum heading in to this week, and Riviera has always been one of his favorite stops on the schedule, as he’s finished 22nd or better in each of his last three appearances at this event, including a runner-up showing in 2016. Did I mention that Kokrak is off to a career-best start on the greens, ranking in the top 25% on Tour in strokes gained putting in 2019? If you’re looking for a dark horse this week, look no further. Kokrak is your man.